My kids always get more excited about the bubble wrap that comes in packages than the item inside. Needless to say, sometimes the item inside might not be to their liking. But even if it is a toy… they still want the bubble wrap first. We got a fun box full of craft supplies and my boys were so excited to see the pom poms…. but when they noticed the bubble wrap sitting on the counter, off to grab the bubble wrap they went. It was not the time to pop the bubble wrap! I told them when mom was ready she would let them know. They went back to playing and I finished several things I was in the middle of. Once I got through I went to give them the bubble wrap since they had moved outside to the deck. 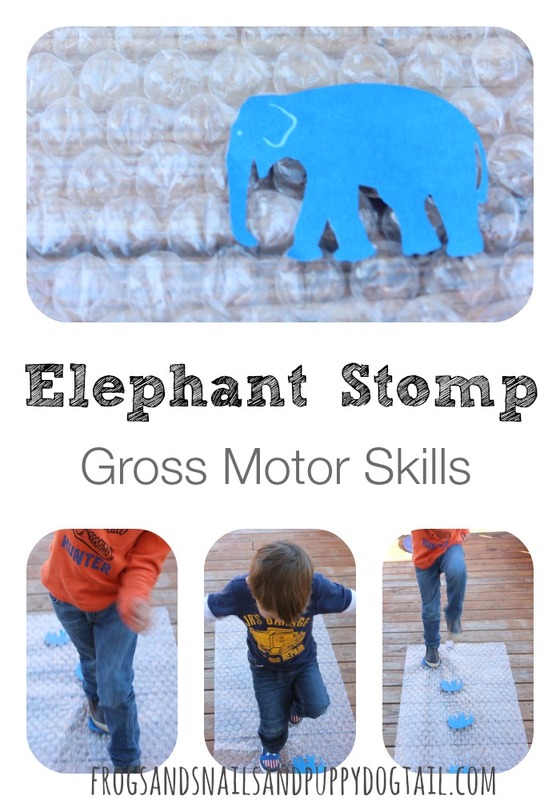 To add a little extra fun I threw together a Elephant Stomp Gross Motor activity to go with it. 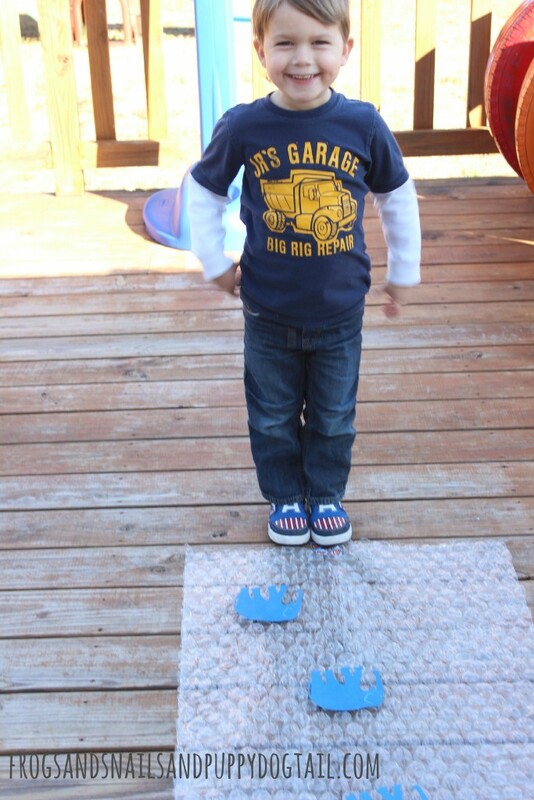 bubble wrap – the large bubbles make this more fun but the small ones work too. We had both and they liked the large one better. 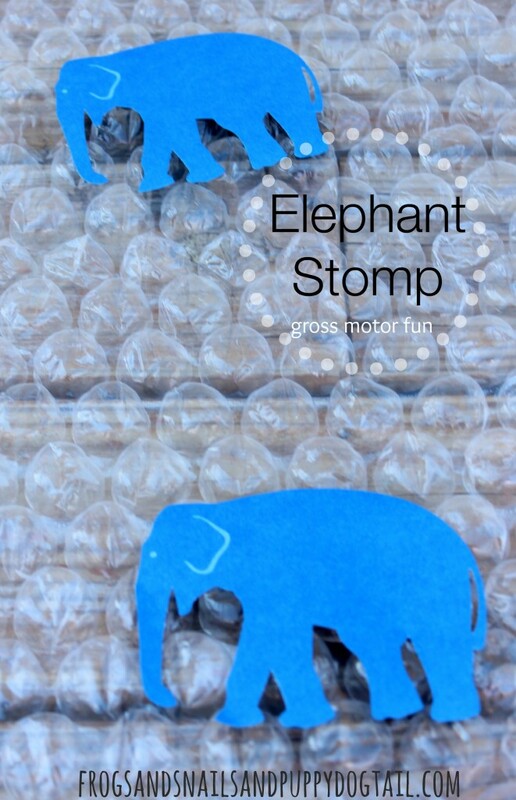 elephant cutouts – we got ours at dollar tree but you could cut some out of paper. 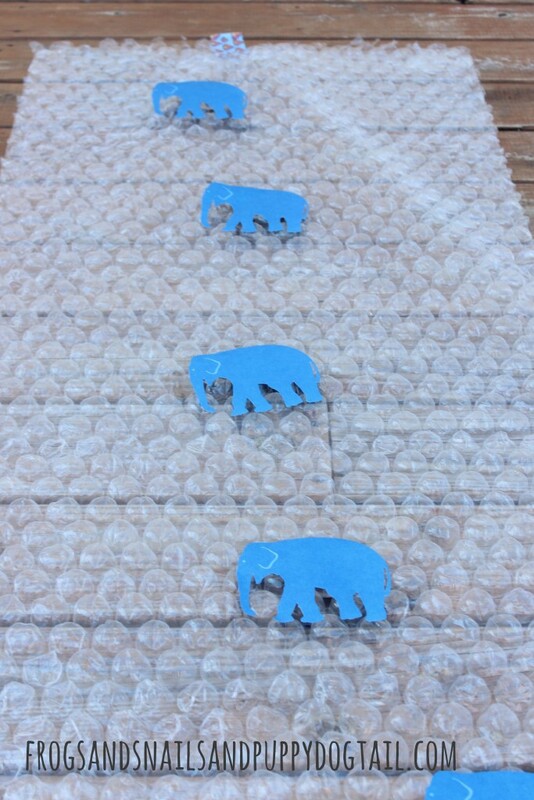 Tape elephants all over the bubble wrap. And then tape the bubble wrap down to the deck. Tell the kids to stomp like an elephant and let them go! My kids love to jump, stomp, skip, hop… so an excuse to do that was a hit with them. This is also a way to get them to work on their large muscle groups or gross motor skills. My boys went on to experimenting with the bubble wrap after stomping on it. They drove their big wheels over it, taped bubble wrap to the tires of the big wheels to see if it would pop…. I love watching them in action on days like this. Those little minds just a going. They did find that the small bubble wrap taped around the tires did not seem to pop. They soon moved back to running the large bubble wrap over until it had nothing left to pop. I can see us stomping on more bubble wrap soon. You can also add in fun elephant facts while they play.